Sometimes the Reminiscing articles come to me in a flash of inspiration. Other times I wrack my brain all week until something finally clicks with me. This week, I wracked my brain all week until something finally came as we were driving home from Chimney Bluffs State Park. Something I saw on the ride home triggered a memory from my childhood. Combined with the Easter holiday, it just seemed perfect. My great-aunt, Dot, was mentally disabled, and she lived in a group home in Sodus, New York. For most of the holidays, she would come to visit her sister, my grandmother, for several days. She sometimes came to stay with Grandma at other times, too, especially around her birthday on July 4th. She always used to tell us that she was special because she shared a birthday with America. On a few occasions, my dad would go out to pick her up and bring her back for my mother’s family. Once in awhile, we’d all tag along for the ride. Either on the ride out there, or on the ride back (my memory of which is not very clear), we’d stop at a burger place for lunch. This wasn’t your typical burger place like McDonald’s or Burger King. This was Orbaker’s Drive-In in Williamson on Route 104. I loved the milkshakes. That I do remember. Coming home from our little day trip on Tuesday, we were driving home on Route 104 when Orbaker’s suddenly popped into view. I was extremely excited. It brought back a flood of memories. I asked Wendy to write down the name of the restaurant so I could use it for this Reminiscing article. If I had known that they had vegetarian offerings for the girls, I definitely would have stopped for dinner there. It wasn’t just the restaurant that I flashed back to. Those visits by Aunt Dot were some of my favorite times of the year. I couldn’t wait to get to Grandma’s house when I knew she was going to be there. I loved playing board games and card games, and so did Aunt Dot. Not that she’d ever let me win. She was ruthless. And if we weren’t watching closely, she’d cheat to make sure she won. And then deny it. But we still played, and learned to love the games. She used to come the week before Easter, going to church with Grandma on Palm Sunday. My siblings and I were each baptised in the Methodist Church on the first Palm Sunday after we were born. I clearly remember when my brother was baptised, and for a long time, had the palm that was given to each person in the church that day. Everyone always brought palms home with them. I can still clearly see a palm that Grandma stuck above the visor in her car. It would last the whole year, crumbling come the following spring, ready to be replaced by its successor. When I was younger, I really didn’t understand what the relationship was between Aunt Dot and Grandma. I couldn’t comprehend the idea that they were sisters and that, once upon a time, they were little girls who grew up together. I heard a few stories about some of their time as children, and them talking about their parents and aunts and uncles. It seemed like a fantasy land to me, but I listened. Maybe I didn’t listen as carefully as I should have, but youth seems to have no place for those concepts. Most of the time it comes too late for us to capture those magical moments. I think her favorite things in the world were horses. She had horse figurines, and she collected photos from magazines if they had horses in them. My sister, I think, still has some of her horse figurines. She simply adored horses. She loved to talk about them anytime, anywhere. If we passed a farm with a horse on it, she made sure to let us know. I had just turned 13 when Aunt Dot passed away. By that time, I had a very strong understanding of our familial relations, and asked a lot of questions. Sometimes, I think I annoyed both my grandmother and Aunt Dot with the endless questions. Other times, I watched both of them kind of drift off during the telling of the story. Today I realize that they were reliving those moments as they spoke. I hope their recollections were as surprising and sweet as the ones I was hit with as we passed that burger stand on the side of the road. 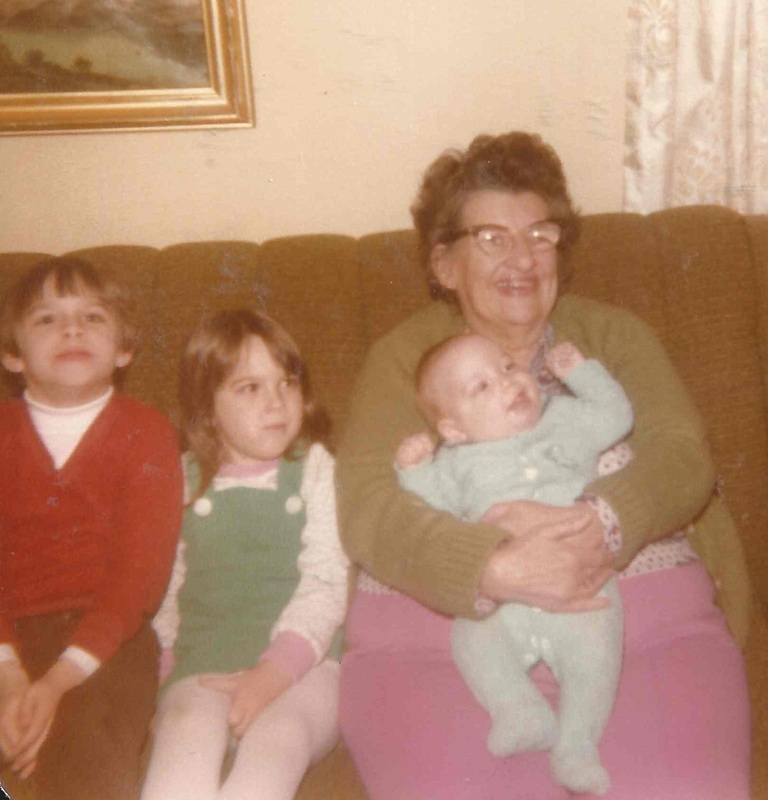 Of those final days with Aunt Dot, there are a couple of things that shine through the memories. The first was I finally beat her at cribbage. I was so proud of myself. She, however, was not very happy. She did not want to play another game against me. The other was how much she spoke of her father on that visit. I would sit in rapt attention as she told her memories, while Grandma clucked when her stories became less memory and more pizazz. It’s funny how passing that one business, on a busy road, brought back so many memories. Orbaker’s was a trigger for this entire article. I occasionally thought of those trips we made to pick up Aunt Dot, but nothing like the flood that came while we were driving home. I guess the next time I’m in the neighborhood, I’ll have to take the family there for a bite to eat. There’s nothing like a burger and a shake to feel like I’m twelve years old again. Craig Bacon wishes everyone a very happy Easter.